I NEED GIFT IDEAS FOR BRANDON’S BIRTHDAY! OMG, I’m SO frustrated right now! I’m sitting on my bed writing because I have a MAJOR dilemma!! It all started earlier this morning. I got a text from Chloe reminding me about our plans for after school. Chloe, Zoey, and I wanted to hang out at the mall today to spend some of our holiday money. And with all of the post-holiday sales, we were sure to find some GREAT deals! We went to Queasy Cheesy first so that we wouldn’t be shopping on empty stomachs. We ordered a large double cheese meat lovers pizza. As traumatic as Queasy Cheesy has been for me in the past, it definitely hit the spot! “Yum!” Chloe picked up a slice and the gooey cheese stretched. She pulled it to the right, then to the left, but it only stretched further! It’s like the cheese was made out of super-strength rubber!! Soon enough, we were all laughing as Chloe waved her pizza all over the place. She looked like a musical conductor that was hyped up on tons of caffeine! But our hilarious moment was ruined when I heard a VERY familiar voice nearby. Chloe and Zoey must have also heard her since their eyes went WIDE with terror. They hunkered down in our booth while I peeked over to keep an eye on her. 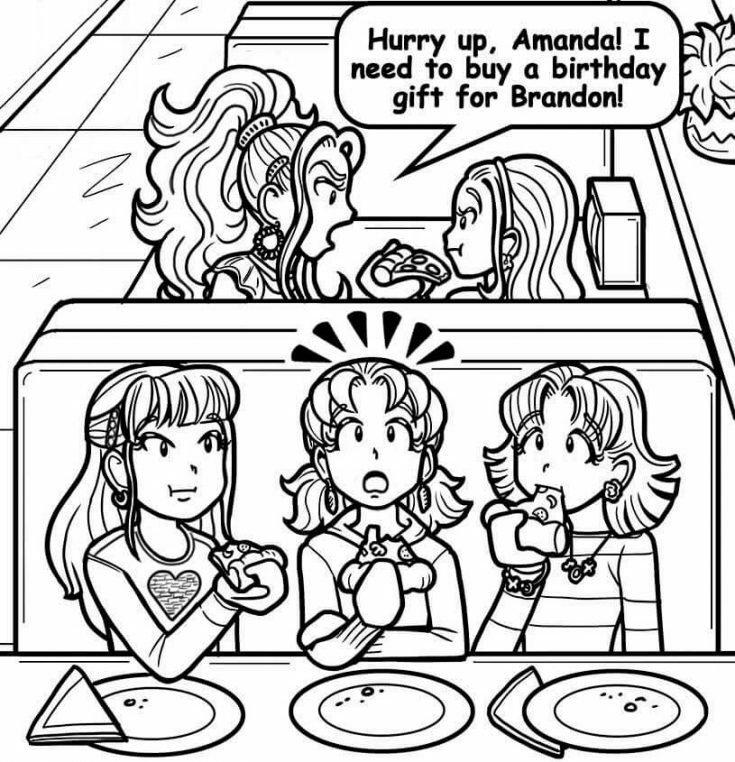 “But I want to SIT and eat,” Amanda fought back. Then they sat in an empty booth right behind us. “You guys! !” I practically shouted to get their attention. But it’s not like I needed to yell, they were right in front of me! My besties just looked at me as if I was crazy. Of course I remembered Brandon’s birthday was this month! How could I possibly forget?! I already had a perfect gift in mind for him! It was even wrapped up and ready in my room at home. But if MacKenzie was trying to win him over with a gift from Picture This, that meant I had to do better! I didn’t want to get in a competition with her, but Brandon is TOTALLY worth it! That’s when I got the fabulous idea to MAKE him something! So far the only idea I have is to turn one of his photographs into artwork, but I’m not sure if that’s cheesier than the pizza we’re eating. So now I’m trying to think of some other heartfelt gift that I can get him for his birthday. I really hope I can think of something soon! Hey readers, help me out! Do you have any super awesome gift ideas for Brandon? Should I buy or make something for him? Tell me your ideas in the comments! Also, have you ever made a gift for someone special in your life? What did you make? OMG! You should invite him to a DATE!!! You should get the best gift ever !!!!!!!!!!!!!!!!!!!!!!!!!!!! Go on a date! It will be awesome!! Use lots of his photos to make a collage. The cut it out in the shape of a puppy. I think you should make him a nice homemade invite for a date! Do a date!!! Ask him out!!! Kiss him!!! Just be yourself,make it random. No matter what, he will love it. Because it is from YOU! uh…..so, I have an idea, I guess! Sense it’s almost Valentines Day, try getting a card and cookies, you create on your own! Remember Nikki that it’s not about the gifts, it is that the fact that it comes from the heart. what ever the present is that you give Brandon, i’m sure he’ll love it! You should homemade it !! It will be made with your love and it will be special!! Buy him a new camera! Or get him a dog!! Or draw a pic of him!! Give him a free kiss, cause it’s obvious he likes you!!!! i think you should either draw him a picture or get him a camera since he love photoghraphy. Get him a homemade card and maybe some really cool new drumsticks? Hey Nikki!Dont worry. Dont buy him some expensive thingies. BTW,you can give him any of your pictures when you were together like the end page of double dorks. It is my suggestion. You are a DORK right,a cool dork right???!!!Yep!!!!!!!!!!!!!!!!!!!! Hey Nikki!Dont worry. Give something to him from the bottom of your heart. Even a chocolate box will be okay. I am sure that he will understand. ALL THE BEST!!!!!!!!!! A card with something that he really likes! I have a fabulous idea. You can take one of the pictures of you and Brandon together and frame it! It would remind him of you! I know it will work! Just give it a try! If you wanna come up with something more original, just doodle something cute on the frame! Forget Mackenzie! She is a pathetic CCP! Omg, if this works, it would be wonderful! But, if you don’t like my idea, just go ahead and do something that you like! But P.S. just tell me how Brandon reacts! !